Blowout Sale! 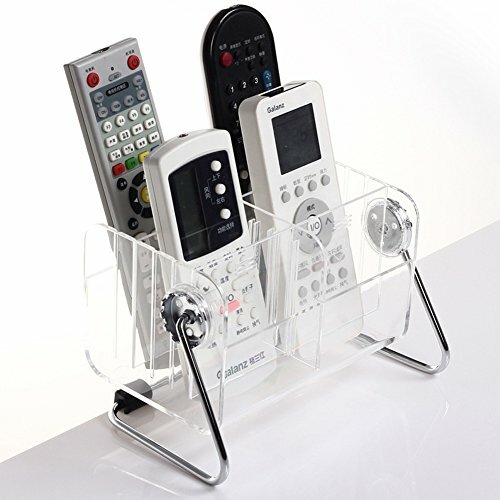 Save 59% on the CHUANGLI 360 Degree Revolving Transparent Plastic Desktop TV Remote Control Storage Organizer by CHUANGLI at RVTE. MPN: CHUANGLI-Y-2833. Hurry! Limited time offer. Offer valid only while supplies last. Specifications: 1. Material: Plastic material 2. Color: Transparent 3. Size: 18*11.5*12 cm 4. Application: Kitchen, Bedroom, Living Room, etc 5. 2. It is essential for home life and can hold cosmetics, jewelry, remote controller, mobile phone and other desktop debris. 3. Great decoration for putting on desk, bedside cabinets, television cabinets, dresser, tea table etc. 4. Set it on a side table as an electronic organizer, creating a centralized place for all your home's various electronic media. 5. 360-degree rotation, the swivelling base allows you to access any item with ease. With everything in one place, you will not waste time looking for important things, just turn it around and search with ease. 360 degree rotate design in the bottom. Many divided compartments to help classifying your stuff. Holder for Desktop debris, cell phones, remote controls, cosmetics, office supplies, Tissue box, etc. Place it anywhere without it taking up the entire surface. Use on your desk, vanity, coffee table, nightstand, bathroom counter. If you have any questions about this product by CHUANGLI, contact us by completing and submitting the form below. If you are looking for a specif part number, please include it with your message.